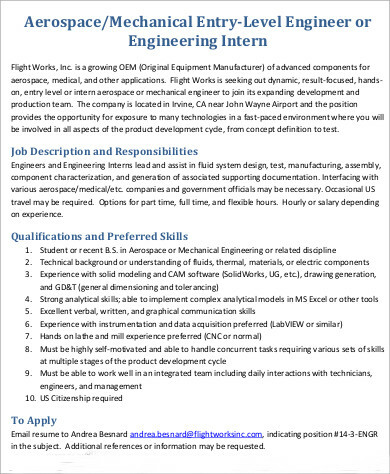 In both civilian and military establishments that involve aircraft design and maintenance, an aerospace engineer is involved in the process of making sure everything functions normally according to plan. In the event of failure, a big responsibility, not the least the loss of lives, lies primarily on the hands of the aerospace engineer. That’s just one of the aspects of how big an aerospace engineer’s responsibilities are. 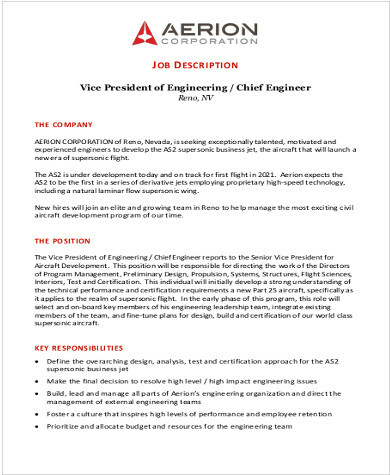 Our Job Description Samples for an aerospace engineer gives a comprehensive list on the duties and responsibilities of the profession that fits a company’s ideals in hiring the most qualified applicant possible. In big aircraft manufacturing companies around the world, competition is quite stiff and the market for passenger aircraft has almost narrowed down to two top competitors. This has something to do primarily with an aircraft’s safety record, which is of prime importance in the successful marketing of the aircraft concerned. For this reason, aircraft manufacturing companies have their own team of aerospace engineers who are being paid top dollars but whose movements are restricted to keep aircraft plans and designs from leaking to their competitors. The same thing goes to defense establishments who hire aerospace engineers to design missiles and military aircraft. 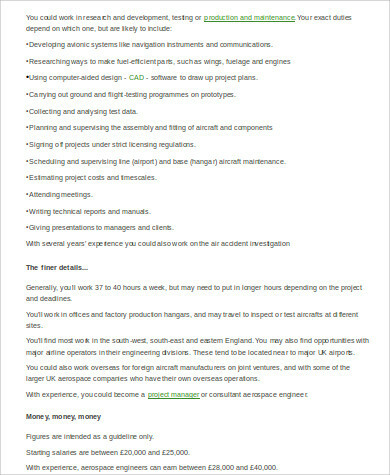 That’s how important and in demand aerospace engineers are. 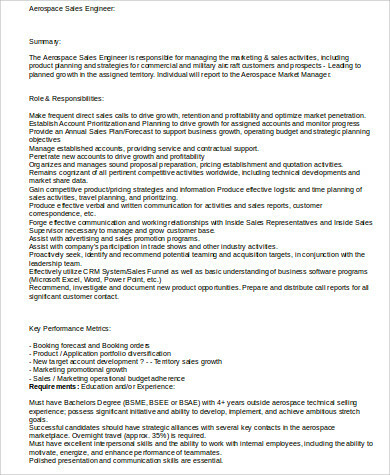 meet and advise potential purchasers of the aircraft. 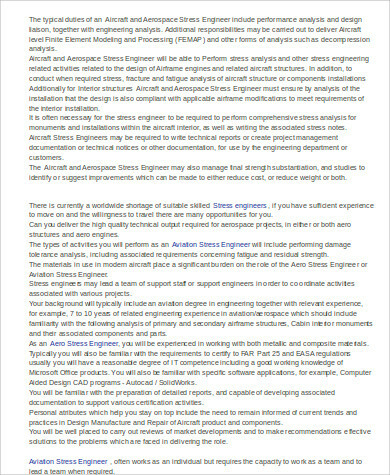 Those are just some of the required duties and tasks required of an aerospace engineer. 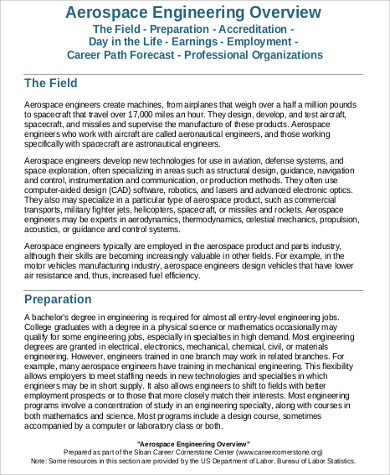 The complete list of responsibilities are quite extensive and made to ensure the competitive level expected of an aerospace engineer. 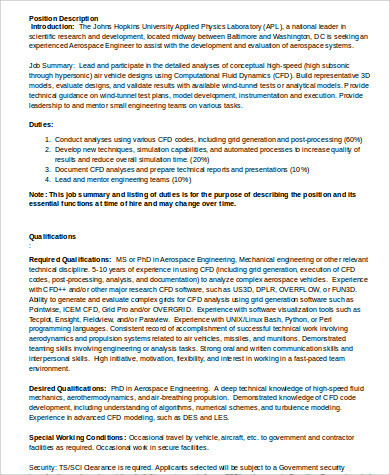 For those looking for qualified individuals with the correct expertise to implement and maintain a company’s computer network, do check out our Network Engineer Job Description Samples. 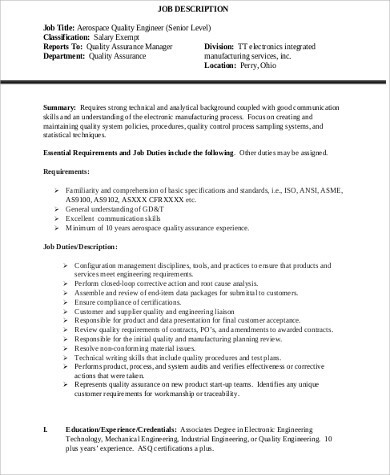 These samples have a comprehensive list of the tasks and responsibilities required of a qualified network engineer. Aerospace engineering have over the years branched into two distinct groups of expertise, that of aeronautical and astronautical engineering. Aeronautical engineering of course deals with aircraft design, construction, propulsion, and aerodynamic qualities of an airplane. The more delicate task of astronautical engineering is reserved for governments and defense establishments who need their expertise for both spacecraft and missile systems. While both branches of aerospace engineering have different environmental and operational concerns, they are still united on the basic rules of physics that bound every scientific and engineering-related projects. 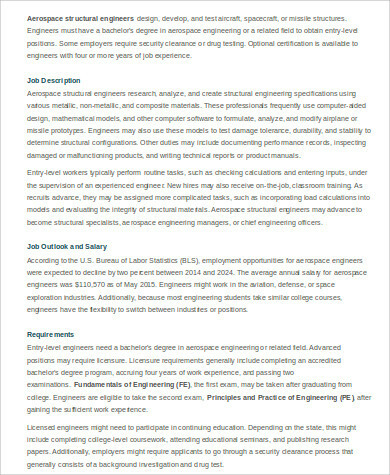 For companies looking to hire civil engineers, do check out our website’s Civil Engineer Job Description Samples should they need the correct format outline to look for qualified applicants. These are all free to download and print.